Gretchinz! Review - GlitchFreeGaming - A fast paced frantic race. Gretchinz! is the first licensed game from Devir Games. From designers Roberto Fraga and Yohan Lemonnier, whom you may recognise as the designers of Captain Sonar, comes a manic racing game set in the Warhammer 40k Universe. We picked up a copy of Gretchinz! at the UK Games Expo, and it saved our weekend. 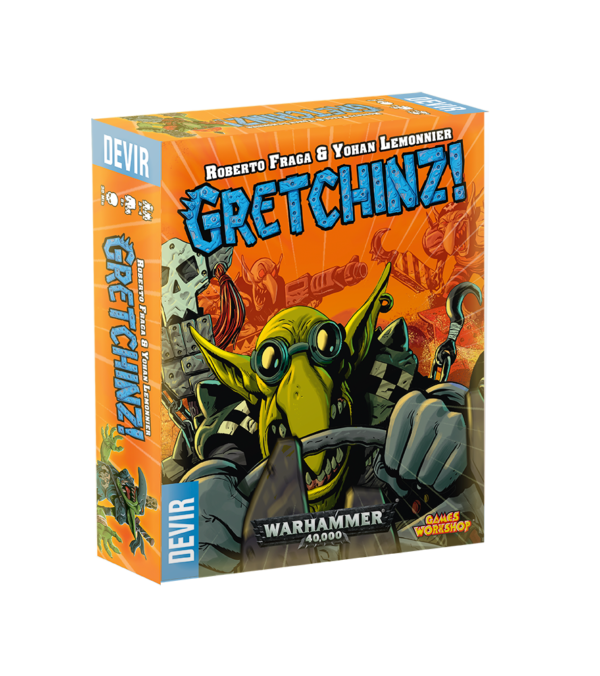 Gretchinz are a weaker but more cunning relative of the Greenskins, who are well-known for their passion for both Speed and Violence. The great Ork tribes all put forward Gretchinz into a spectacular race. None are expected to make it out alive, so long as they entertain the crowd. Speed and violence are far more entertaining than safety regulations! And this concept translates into a really fun, fast paced board game. The players all choose a tribe to represent, and a colour to represent them. In the box there are four coloured buggies that need to be assembled. This became our first hurdle, as there are no instructions on how to assemble the buggies. But we eventually figured it out based off the pictures in the rule book. And the end result is some cool looking counters to use during the race. 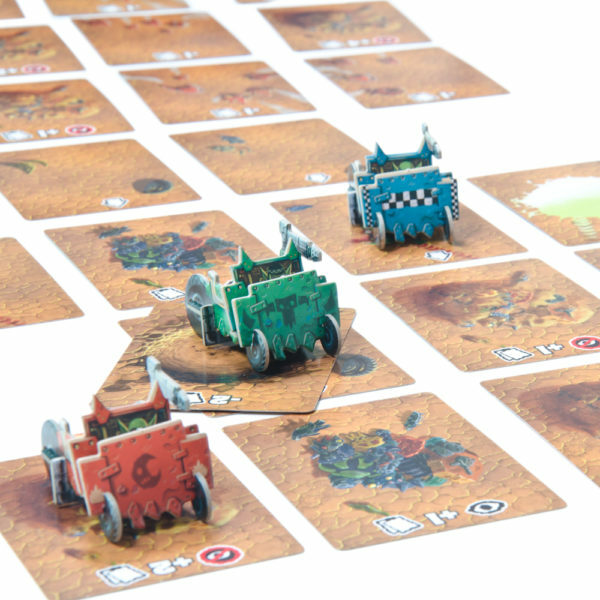 To begin the race, the 2-4 player buggies are set up at the starting line, and cards are placed down in front of them. The cards in Gretchinz! are dual purpose. On one side are images that represent the road ahead. On the other side are the attack symbols you will use later on. Every time a player moves, three new cards will be laid out in the path ahead. One immediately in front, and one either side of that. The players are only able to progress forwards by swerving diagonally left or right. But in order to do that, they need to roll some dice. This is where the frantic part of the game comes in. Everyone rolls their three dice at the same time, and can continue to roll their dice to try and get the result they want. As soon as someone does, they shout “Waaagh!” At this point, everyone stops and has to use the dice they have in front of them. 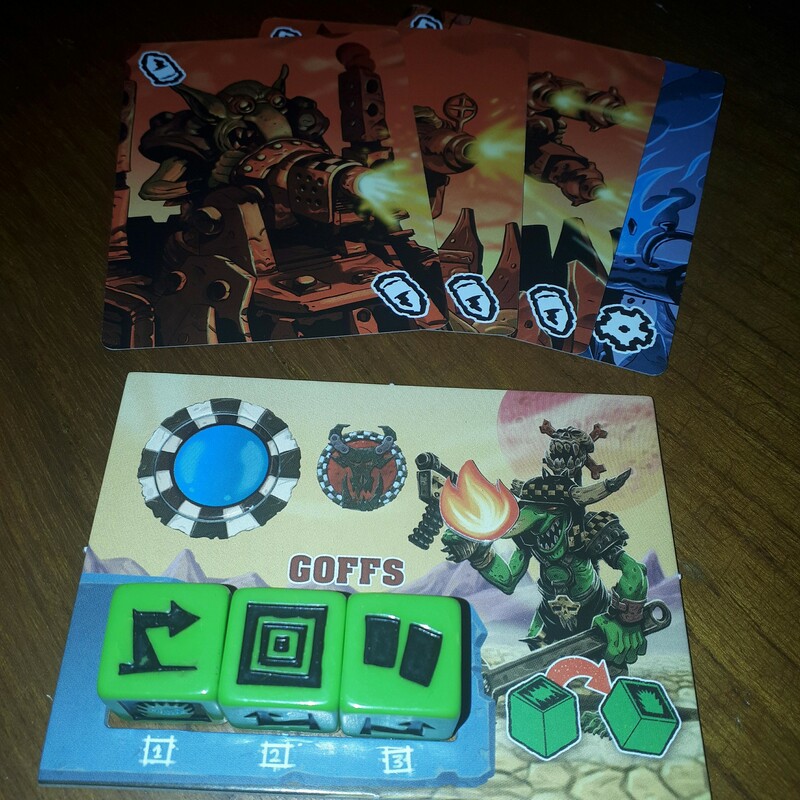 The dice will either let you move, attack, draw cards, use the Klan ability or look into the future! The Klan abilities are an optional rule in the game that can be thrown in to spice it up once players are familiar with the core mechanics. But apart from movement, all the other results have to do with the other side of the cards. Players draw five of the double-sided cards at the beginning of the game, and hold them in their hands with the road side facing them. But the important side of these cards is the attack side. When you want to attack another player, you play two of the cards from your hand. If both are Attack (Red) then you successfully hit your opponent. If either of them are Problem (Blue) cards, then somethings gone wrong, and you take damage instead. The key thing to remember is, you don’t know what cards you have in your hand. That is unless you roll a certain side of the dice. This allows you to look through the Eye of Mork (or maybe Gork), and ask another player how many attack cards you have in your hand. They must tell the truth! This then gives you a sense of your change of success if you are going to try an attack on someone. It’s a really neat mechanic that fits the chaotic theme of Gretchinz! The race is over when someone reaches the seventh row of cards. Or at least, that’s what the rules suggest. If you have the space, there’s nothing to prevent you from defining your own finish line. The only thing to bear in mind is the width of your track. As you can only move diagonally, it’s entirely possible that you end up nearly going off the edge of your table. But there has been a rule thought for that too. Quite simply, if you’re going to go off the edge of your play space, then you can’t move in that direction. 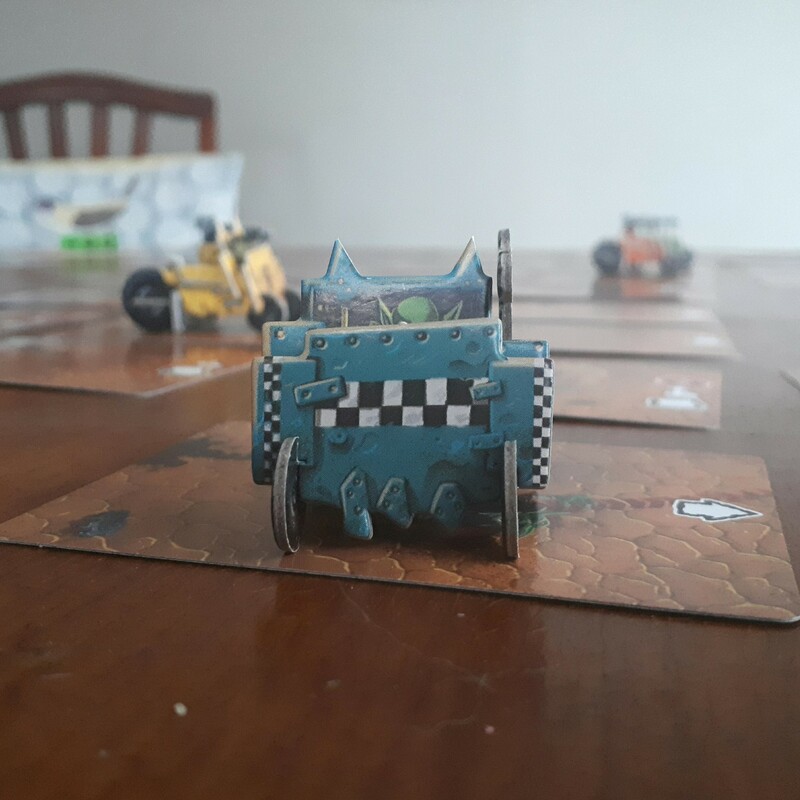 What’s more, if you have the space then you can combine two sets of the game for an 8 player race! Gretchinz! is a lot of fun. You can listen to our Day 3 round up to hear how much fun we had playing it at the expo. After a not great evening experience, Gretchinz revived our weekend and got us set for the final day. And it’ll be one that we bring out to kick off many game days in the future. My god. This game has no decision and only benefits who Waags first. A TEN because you play it at a expo.